The new Silverspot is at Met Square in downtown Miami. Does your family love going to the movies? And do you love reclining in a plush oversized chair while someone brings you gourmet bites and craft cocktails? Then the swanky new Silverspot Cinema that just opened downtown is worth a visit. The upscale theater is actually massive but has an intimate feel comprising 70,000 square feet and six floors, and is located at Met Square (across from Whole Foods downtown). First, there’s the free “selfie photobooth” in the lobby that is a huge hit with the little ones (and provided a necessary distraction as we had some time to kill before our movie started). Then there’s the extensive menu of in-theater dining like ricotta and truffle flatbread, BLT lobster rolls, burrata and tomato bisque and coconut cake. Of course the young folk will love the chicken tenders and fries and mini-sliders, but there are also a handful of salads and some lighter offerings. There are dozens of cocktails offered including flavored mojitos and margaritas plus beer and wine. My kids loved using the electric recline button on the chairs and spreading out with their twizzlers and popcorn on the attached tray tables. Plus, since the theater is still relatively new we had a practically-private screening room for our weekday day-time movie. Pro tip: park at the Met3 building and get your parking validated at the theater for an $8 rate. Rainy days (or incredibly hot days) call for indoor play spaces where the kids can bounce off the walls (literally) and parents can lounge with free wifi. Luckily the new Gecko ParX achieves all these things and more: the brand-spanking new center features 40,000 square feet of activities with a main trampoline court with interlocking trampolines, a vast arcade, two basketball slam dunk courts, a custom Soft Play playground for toddlers, two trampoline dodgeball courts, and a multi-attraction pit that features jousting and a slackline. Other features include a ropes course and a speed rock-climbing wall that encourages guests to compete for the fastest climb. 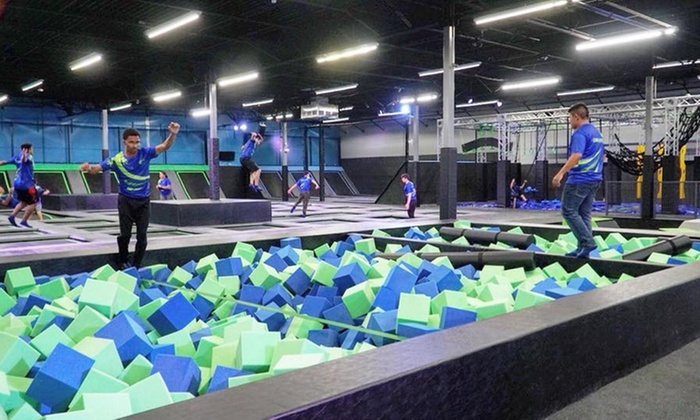 Gecko ParX also houses a modular two-lane ninja warrior attraction with connected parkour course. Additionally, there is a café shop with a variety of food and beverage options including pizza, wings, soft drinks, desserts and more. Beer and wine is available for adults. A lounge for parents includes seating areas with massage chairs, electrical outlets to plug in any device and a panoramic view of the venue. The beloved animal attraction park has reopened after an extensive renovation following damage sustained during Hurricane Irma. And there’s lots more to experience now including the Super Flight outdoor skydiving simulator (which is technically outside the park and not included in park admission), and NeoSplash water park, which is scheduled to be at Jungle Island through Labor Day. There’s also a Nerf Battle Zone, an enclosed foam-dart battleground, similar to an indoor paintball course, in the space where the ligers used to be (they were moved after the hurricane to an animal sanctuary in another state). There are now food trucks dispensing lunch-time meals and lending a hip factor to the family-oriented attraction. The Neosplash is included in general admission and features four large inflatables slides and two pools, catering to both kids and adults, and giving everyone a much-welcome break from the heat of walking around the park. Plenty of animals are still at the park like the orangutans, birds, lemurs, alligators, giant tortoises and of course – exotic birds – you’ll hear them the minute you walk through the lush grounds. If you’re looking to splurge and get a more intimate experience with the animals, book a VIP tour with Ryan Jacobs, director and creator of the VIP tours at Jungle Island. Jacobs will give you a behind-the-scenes look at many of the animals at the park, allowing you to meet and feed lemurs, those hundred-year-old tortoises, an adorable baby Kapuchin monkey and the most thrilling of all – to feed a live alligator. And if you’ve ever wanted to pet a Condor – one of the most dangerous birds, and an endangered species – this is your chance. Jacobs tailors each tour to fit the interests of the guests and is a wealth of information about the animals and the history of the park. Wynwood’s popular indoor entertainment spot just rolled out a slew of weekday specials to get you motivated to spend some quality family time – if for you that means endless games of bumper cars and arcade action. On Tuesdays and Thursdays $35 gets you two hours of unlimited arcade games while on Wednesdays $24 gets you two hours of unlimited laser tag and spin zone. And Friday August 17th they’ll be hosting a back-to-school party at 5:30pm with live DJ, face paint and food trucks. RSVP here. Just a little over a year old and the The Phillip and Patricia Frost Museum of Science continues to roll out new and exciting exhibits to keep everyone coming back for more. Among the new offerings are: “The Power of Poison: From the Depths of The Sea to Your Own Backyard,” an exploration of all things toxic from bubbling cauldrons and slimy frogs to venomous bites. There’s also “Da Vinci – Inventions,” an interactive exhibit that features full-scale interpretations of the mastermind’s inventions and unparalleled studies of his iconic art. And on Level 3 of the West Wing, are the ‘pulley chairs’ that use a system of ropes and pullies to hoist yourself several feet into the air before allowing the force of gravity to pull you back toward the ground. Recently the Frost introduced their “Overnight Adventures” where kids and their parents can have a sleep over at the museum. The program includes night time activities like rooftop star gazing, a hands-on science activity, a late-night planetarium showing, a commemorative t-shirt, dinner and breakfast and a chance to snuggle up amidst all that spectacular science. The program is designed for kids ages 5-17 and cost is $80 per person (adult or child) and includes a voucher to return to the museum for a future visit. The theme for the next overnight on August 24th is “Blast from the Past,” focusing on dinosaurs and fossils.